Well, ladies and gents, we tried. 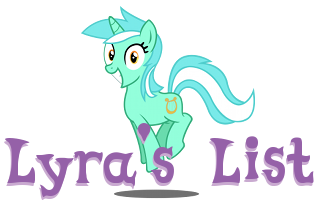 Unfortunately, we're just not receiving a workable amount (read: usually any) of submissions for Lyra's List, and that combined with what we've seen in the comments from the two previous entries, has led us to decide to shelve these posts indefinitely. We've concluded that, simply put, the fandom at-large and the horsegamedev scene itself just isn't active enough to warrant these dedicated posts anymore; there's just not enough signal nowadays for these smaller projects and ideas to be lost in the noise like they used to. Honestly, though, we feel that this is actually a good thing in a way, as all active projects can now get their "help wanted" posts on our front page without need for competition or compilation posts to catch what we'd otherwise miss. Not to mention this frees up some small resources for and gives us all the more drive to add other site projects somewhere down the line! So, with all that said, down below is the totality of what we've received over the past two entries, and to their submitters we extend our deepest thanks for participating! Happy developing! "Very long term, but doable"